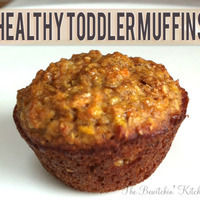 Mini muffins for toddlers loaded with veggies & fruits. Contains little sugar. Preheat oven to 375 F and spray mini muffin tins with non stick cooking spray (I used butter flavor). Beat the brown sugar and apple sauce in your mixer until mixed well. Add carrots to food processor (I used a Ninja blender) and pulse until they're grated. Add to mixer along with bananas and the jar of baby food. Mix until well combined. One at a time add eggs, allowing time for the first egg to be incorporated before adding the second. At this point you can add the dry ingredients and beat until it comes together. Bake for 20-22 minutes, or until toothpick comes out clean. I like this. Seems a good dish to try.